Here are three new novels, all tales of love set in the past. The farther back in time they go, the more satisfying the read, but each has their flaws. 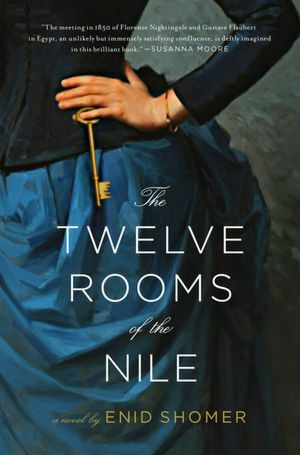 City of Women is weighed down by the burden of the Holocaust, The Twelve Rooms of the Nile is overshadowed by the geniuses it is meant to portray and John Saturnall's Feast perhaps hews too closely to the recipe of romance. All offer dependable, intelligent entertainment, though only Feast comes close to a truly satisfying novel. 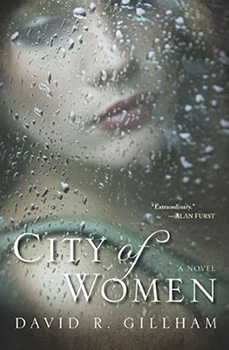 David R. Gillham's City Of Women is set in Berlin in 1943. It's the height of World War II, of course, and Berlin is a city of women because so many men who aren't children, wounded or elderly are simply gone: fighting at the front or otherwise trapped in the war machine. Sigrid Schroder is a frustrated woman -- not because she misses her husband fighting at the front, but because she doesn't. Gillham does a very good job of capturing the tension and fear that enveloped what was by then the dictatorship of Hitler's Third Reich. Family, friends, neighbors: literally none of them could be wholly trusted. Schroder only finds escape at the cinema. That's where she stumbles into two adventures. One involves the mysterious man she is immediately drawn to physically and the other is the house girl of a neighbor. Before she knows it, Sigrid has taken a lover and is helping the girl in the underground movement to smuggle Jews and others out of the country via bribes and seduction and violence. These stories collide when the man she loves is revealed to be a Jewish refugee himself or a traitor sniffing out other Jews in return for privileged treatment by the Nazis or perhaps some tortured combination of the two. The cover image is beautiful and romantic and quite faithful to the spirit of the book. Which is precisely the problem: ultimately, World War II, the Holocaust, the fraught tension of life in war-torn Berlin all become a mere backdrop for the romance. It's further marred by a climax straight out of Hollywood. Throughout the novel we're always right beside our heroine. But suddenly at the end she has arranged an elaborate scheme we know nothing about but which unfolds for us quite dramatically. It should work well in the film version that might just get made. Gillham does, however, create a palpable atmosphere of dread and some vivid characters that make the novel worthwhile for fans of Alan Furst (who gave the book a rave) and the like. Stepping back farther into the 19th century, poet and short story writer Enid Shomer has taken a fragment of historical fact and woven it into a tale of frustrated desire. It appears that Gustave Flaubert and Florence Nightingale went on a trip down the Nile at the same time. But their frustrated desire is not strictly for each other. Flaubert felt a flop after his tentative first novel was dismissed out of hand by his closest friends as utter tripe. If he had any passion, it was mostly for prostitutes. And Nightingale turned down a suitor against her family's wishes because she yearned for a purpose in life, to be useful. Shomer imagines them crossing paths, sparring intellectually, discovering a kindred spirit and finding solace in the mind of an equal, something neither was accustomed to discovering. The setting is exotic to these European travelers and Shomer neatly illustrates the suffocating restrictions placed on women at the time. Exploring pyramids, going on camel rides, being "kidnapped" by natives and other events all spur along their growing admiration for each other and determination to make something of themselves. Flaubert sees this woman struggling to escape the bonds of convention and gets the germ of an idea that will become Madame Bovary. Nightingale discovers clean and hospitable places where the ill are allowed to convalesce and finds her calling. If this novel were about two other people, I'd like it more. But despite the fact that I know next to nothing about these historical figures, I never quite bought that this was the towering literary genius Gustave Flaubert or the pioneering medical revolutionary Florence Nightingale. That keeps them always one step removed from reality, not quite coming to life, like a play or movie where some famed historical figure pops in. "Ah, Mr. Twain! How pleasant to see you!" Shomer's tale is an engaging one with a strong sense of time and place. The two figures at its heart are interesting characters and yet not seemingly quite whom they claim to be. 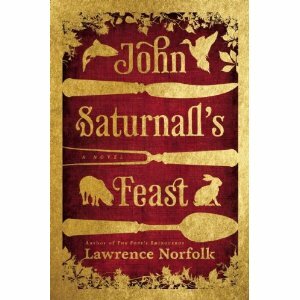 Finally, and most successfully, we go back even further in time to the 17th century and John Saturnall's Feast. Lawrence Norfolk, the author of Lempriere's Dictionary, delivers a romance suffused with a love of food. Our hero John is the son of a woman accused of witchcraft. In fact, she provides healing herbs and medicines for the people of their village. But there's a deeper truth to the charge because John's mother also keeps alive the pagan traditions of a feast shared by one and all, a tradition that predates Christianity and upends the social order. Bullied and picked on by the other children, John has a miserable existence that only becomes worse when religious fanaticism rears its head and they're driven into the woods, where she starves to death and he struggles simply to live. But his mother's parting gift is to teach John to read and thus memorize the book she always carries: an elaborate description of the feast itself, dish by glorious dish. Before you know it, John has been deposited at the dreary Buckland Manor to apprentice in the kitchen. His remarkable sense of smell (John can parse out spices and flavoring with ease) sends John flying through the ranks until he's second in command. That's when he's ordered to tempt young Lady Lucretia into breaking her fast with succulent dishes and thus fulfill her father's wishes and marry the tiresome Piers Callock. Would you be surprised to discover that John and Lady Lucretia fall in love? But their impossible romance becomes even more dangerous when rebellion spreads and the King is overthrown by Oliver Cromwell and his fanatic followers. (They don't even like Christmas!) War, betrayal, the need to save Buckland Manor and a pious disapproval of sensuous meals all combine to frustrate this upstairs/downstairs romance and John's gift for elaborate dishes. Norfolk delivers a strong tale filled with atmosphere and the odd, telling detail that convinces. But a great chef can improvise and make a dish his own. Here Norfolk sticks too closely to the recipe for romance, right down to a predictable and rather hard to swallow finale that doesn't satisfy, thanks to unlikely turns of fortune and revelations that don't surprise in the least. But this doesn't detract from the essential originality of the tale, the pleasure with which it is told and the satisfaction of a feast that exists only in the imagination. Thanks for reading. Michael Giltz is the co-host of Showbiz Sandbox, a weekly pop culture podcast that reveals the industry take on entertainment news of the day and features top journalists and opinion makers as guests. It's available for free on iTunes. Visit Michael Giltz at his website and his daily blog. Download his podcast of celebrity interviews and his radio show, also called Popsurfing and also available for free on iTunes. Link to him on Netflix and gain access to thousands of ratings and reviews. Note: Michael Giltz is provided with free galleys and/or final copies of books to consider for review.